Come and join me in my workshop back when this engine was under construction. I didn't photograph every detail, but I did manage to cover at least something concerning each of the major components. 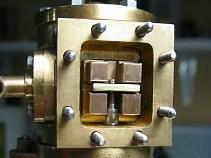 The primary construction material was Naval Brass, a simple combination of Copper, Zinc and Tin. It is sometimes referred to as Naval Bronze, due to the tin content. 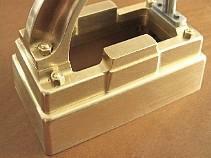 The metal has a beautiful golden color and takes a high polish. 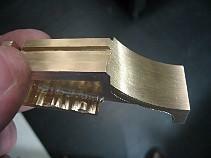 It has an extra warmth and richness not evident in the greenish hue of the leaded free-cutting brasses. 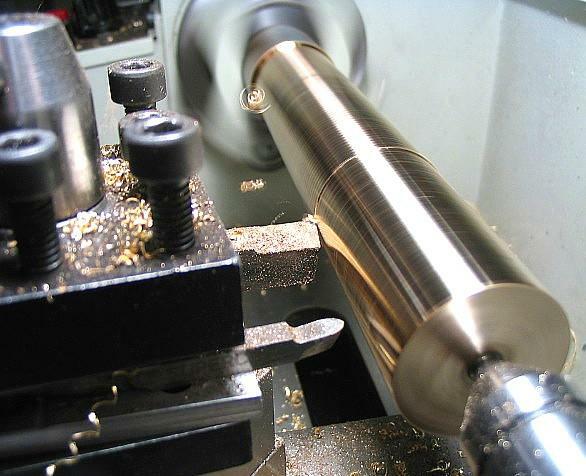 It is quite hard and it doesn't acquire the myriad of small scratches and dents that are so common with brass and aluminum during the working and hand fitting of components. 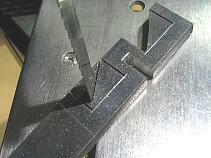 This can be a big advantage when holding components in a milling vise (or accidently dropping a finished part on the workshop floor!) 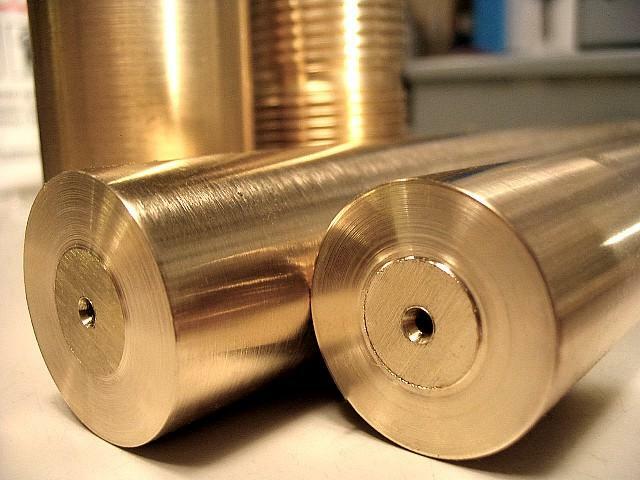 My past experience with naval brass has convinced me that objects made from this metal are both appealing and durable. I have mentioned elsewhere on this site that the machinability factor for this alloy is quite low, compared to common free-cutting varieties of leaded brass, steel or iron. 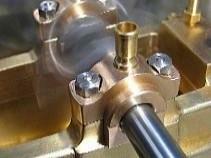 This may raise the question, were any tricks or techniques discovered which would ease the process of machining naval brass? No tricks! 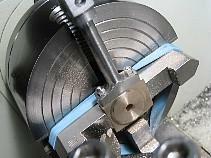 - just keep the tools razor sharp and don't expect a perfect finish from the lathe or mill. 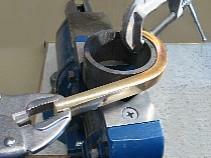 Do expect more heat to be produced than with free-cutting brass. Plan to use a file and/or emery and liquid abrasives for surface finishes. 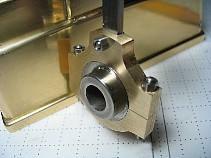 The result of this extra effort will be an attractive and long-lasting workpiece. The raw stock for the project being turned from an old 1½ inch propeller shaft. Check out those chips floating in mid air! 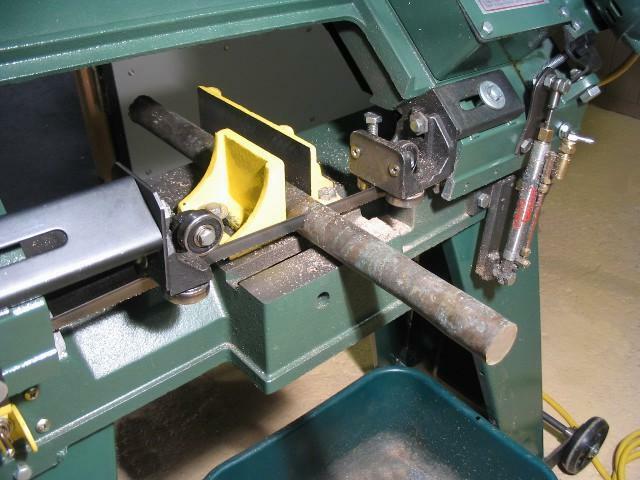 Here a piece of the scrapyard shaft is being cut in the Craftex 4" x 6" horizontal bandsaw. 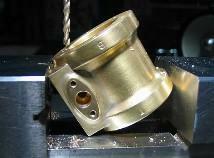 This actual piece eventually became the engine's six-spoked, 3½ inch diameter flywheel.